MCF7, 293T, NIH3T3 and HeLa whole cell lysate (ab150035) and Primary human lung fibroblasts. 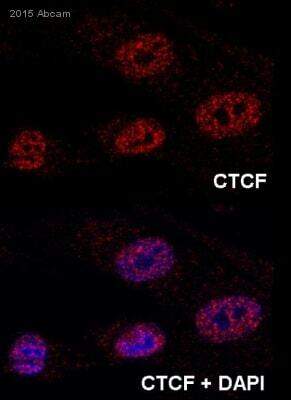 ab70303 was affinity purified using an epitope specific to CTCF immobilized on solid support. Our Abpromise guarantee covers the use of ab70303 in the following tested applications. Detects a band of approximately 100 kDa (predicted molecular weight: 83 kDa). IHC-P 1/100 - 1/500. Perform heat mediated antigen retrieval with Tris/EDTA buffer pH 9.0 before commencing with IHC staining protocol. Chromatin binding factor that binds to DNA sequence specific sites. Involved in transcriptional regulation by binding to chromatin insulators and preventing interaction between promoter and nearby enhancers and silencers. Acts as transcriptional repressor binding to promoters of vertebrate MYC gene and BAG1 gene. Also binds to the PLK and PIM1 promoters. Acts as a transcriptional activator of APP. Regulates APOA1/C3/A4/A5 gene cluster and controls MHC class II gene expression. Plays an essential role in oocyte and preimplantation embryo development by activating or repressing transcription. Seems to act as tumor suppressor. Plays a critical role in the epigenetic regulation. Participates to the allele-specific gene expression at the imprinted IGF2/H19 gene locus. On the maternal allele, binding within the H19 imprinting control region (ICR) mediates maternally inherited higher-order chromatin conformation to restrict enhancer access to IGF2. Plays a critical role in gene silencing over considerable distances in the genome. Preferentially interacts with unmethylated DNA, preventing spreading of CpG methylation and maintaining methylation-free zones. Inversely, binding to target sites is prevented by CpG methylation. Plays a important role in chromatin remodeling. Can dimerize when it is bound to different DNA sequences, mediating long-range chromatin looping. Mediates interchromosomal association between IGF2/H19 and WSB1/NF1 and may direct distant DNA segments to a common transcription factory. Causes local loss of histone acetylation and gain of histone methylation in the beta-globin locus, without affecting transcription. When bound to chromatin, it provides an anchor point for nucleosomes positioning. Seems to be essential for homologous X-chromosome pairing. May participate with Tsix in establishing a regulatable epigenetic switch for X chromosome inactivation. May play a role in preventing the propagation of stable methylation at the escape genes from X- inactivation. Involved in sister chromatid cohesion. Associates with both centromeres and chromosomal arms during metaphase and required for cohesin localization to CTCF sites. Regulates asynchronous replication of IGF2/H19. Ubiquitous. Absent in primary spermatocytes. Belongs to the CTCF zinc-finger protein family. Contains 11 C2H2-type zinc fingers. The 11 zinc fingers are highly conserved among vertebrates, exhibiting almost identical amino acid sequences. Different subsets or combination of individual zinc fingers gives the ability to CTCF to recognize multiple DNA target sites. Sumoylated on Lys-74 and Lys-689; sumoylation of CTCF contributes to the repressive function of CTCF on the MYC P2 promoter. Nucleus > nucleoplasm. Chromosome. Chromosome > centromere. May translocate to the nucleolus upon cell differentiation. Associates with both centromeres and chromosomal arms during metaphase. Associates with the H19 ICR in mitotic chromosomes. May be preferentially excluded from heterochromatin during interphase. 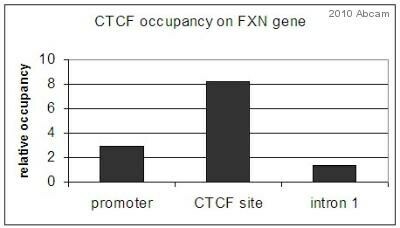 Analysis of Human CTCF by Chromatin Immunoprecipitation (ChIP). 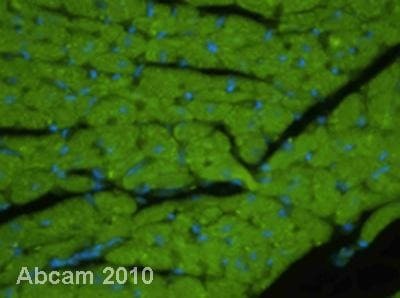 Primary human fibroblasts from lung (5 x 107 cells) were cross-linked with formaldehyde, sonicated, and immunoprecipitated with 20µg ab70303. 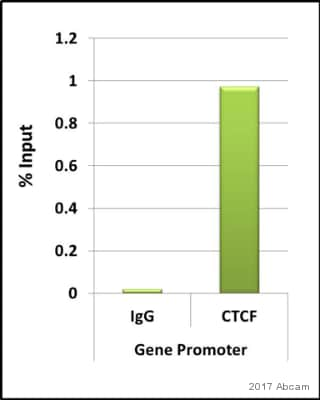 The resulting ChIP DNA was quantified using real-time PCR with primers against the IGF2-H19 ICR or a control region in the HoxA cluster. Samples: Whole cell lysate (50 µg) from CT26.WT, 4T1, Renca, and TCMK-1 cells. ab70303 used at a dilution of 0.2 µg/ml. Detection: Chemiluminescence with an exposure time of 30 seconds. Immunohistochemistry (Formalin/PFA-fixed paraffin-embedded sections) analysis of human ovarian carcinoma (left) and mouse renal cell carcinoma (right) tissues labelling CTCF with ab70303 at 1/100 (2µg/ml). Detection: DAB. 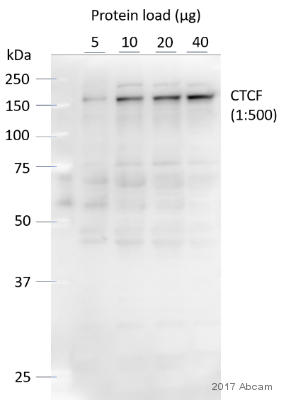 Detection of Human CTCF by Western Blot of Immunprecipitate. Lane 1: MCF7 whole cell lysates immunoprecipitated using ab70302 at 3µg/mg lysate (1 mg/IP; 1/4 of IP loaded/lane). Lane 2: MCF7 whole cell lysates immunoprecipitated using ab70303 at 3µg/mg lysate (1 mg/IP; 1/4 of IP loaded/lane). 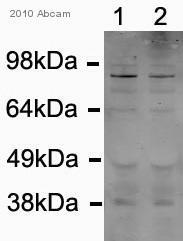 Lane 3: MCF7 whole cell lysates immunoprecipitated using ab70304 at 3µg/mg lysate (1 mg/IP; 1/4 of IP loaded/lane). Lane 4: control IgG was used for immunoprecipitation. All lanes: ab70303 at 0.03µg/ml. Detection: Chemiluminescence with exposure times of 10 seconds. 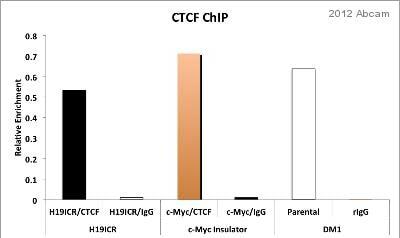 ChIP&apos;ed with non-specific IgG, and tested by real-time qPCR in CTCF positive control regions such as H19ICR, c-Myc insulator and DM1 region. LNCaP cell chromatin ChIP&apos;ed with CTCF antibody, and tested by real-time qPCR in CTCF positive control regions such as H19ICR, c-Myc insulator region and DM1 regions.